Often times the most active pets are the ones who suffer the most from joint and muscle pain. 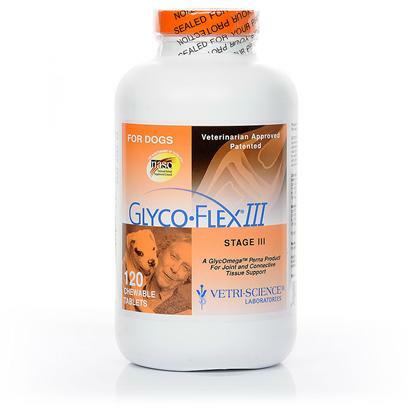 GlycoFlex III is specifically formulated to alleviate joint inflammation and stiffness, which are a common occurrence in working, highly active and senior stage dogs. Combat natural wear and tear with the nutritional formula found in GlycoFlex III. Containing vitamins C and E, glucosamine, MSM (methylsulfonylmethane-a vital source of nutritional sulfur for joints and muscles) and grape seed extract, GlycoFlex III has only human-grade ingredients. This product can also be used safely in conjunction with NSAIDS (non-steroidal anti-inflammatories). Consult a veterinarian before starting any new medication, especially if this formula if being used post orthopedic surgery. Also, use caution if your dog is talking glucosamine supplements to combat diabetes or weight gain. Brewers Yeast, Cellulose, Dicalcium Phosphate, Natural Imitation Roast Chicken Flavor, Silicon Dioxide and, Stearic Acid. GlycoFlex III is tablet to be administered daily by mouth with or without food. Specific dosage is dependent on the dog’s weight, and should be given daily for 4-6 weeks initially, then reduced to a maintenance level. When a dose is comprised of more than one tablet, it should be divided into morning and evening installations.